For Don Quixote, windmills were monstrous giants, some with arms nearly two leagues long. But for El Centro resident Efren Ramos, windmills such as the 112 being built west of here, are the source of income that pay for his daughter’s wedding. “I told her that my limit was $25,000,” said Ramos with a laugh while referring to his daughter, who’s marrying at a San Diego beach in December. The 56-year-old had been retired for more than a year when the project began and was doing OK, he said. And yet, he has worked all his life, so when the opportunity came up to work at the project, Ramos decided to come out of retirement. He is now part of the civil crew, doing day-to-day operations, meaning he does roadwork and “anything else that comes up,” such as loading and unloading material or even cholla plant relocation. 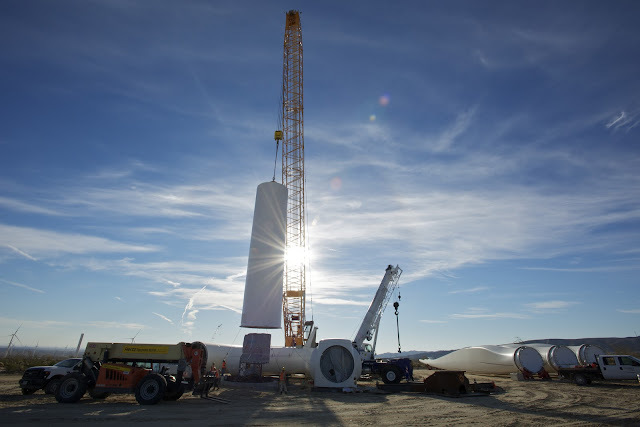 Ramos is one of some 350 people, about half of them local, who are employed by Pattern Energy and its Ocotillo Wind Express, a renewable energy project comprised of windmills — or better said, wind turbines — unlike any Don Quixote author Miguel de Cervantes was likely to imagine. 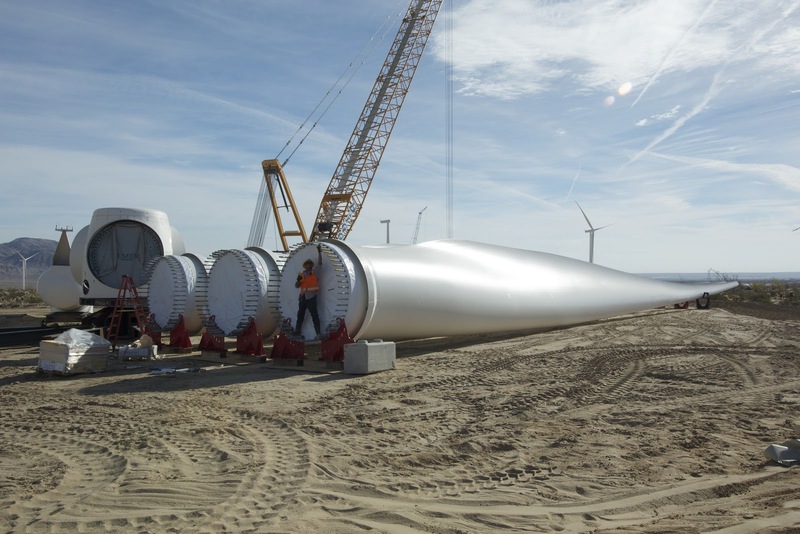 That is because once commissioned, these wind turbines roughly the size of 40-story tall buildings and blades the size of a 747 Boeing passenger jet won’t power mills; they will power about 94,000 homes in San Diego, according to U.S. Bureau of Land Management figures. 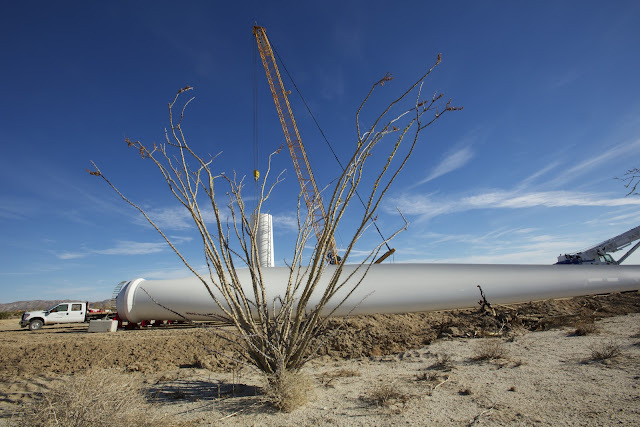 The Imperial County Board of Supervisors approved Ocotillo Wind Express on April 2. Some three weeks later the BLM did the same as the lead agency in charge of this project that the federal government selected as one of many priority projects needed to diversify the nation’s energy portfolio. Construction began in May amid lawsuits filed by local Native American tribes, environmental organizations and some residents who oppose the project over cultural, biological, health and aesthetic concerns. Just last month, a lawsuit filed by Community Advocates for Renewable Energy Stewardship was dismissed in a San Diego federal court. Lawsuits are also pending from the Quechan Tribe, the Desert Protective Council and a joint suit by Protect Our Communities Foundation, Backcountry Against Dumps and activist Donna Tisdale. However, thus far, lawsuits have been unsuccessful in halting the project. All facets of the project are in one stage or another at this time, said construction manager Joan Inlow. 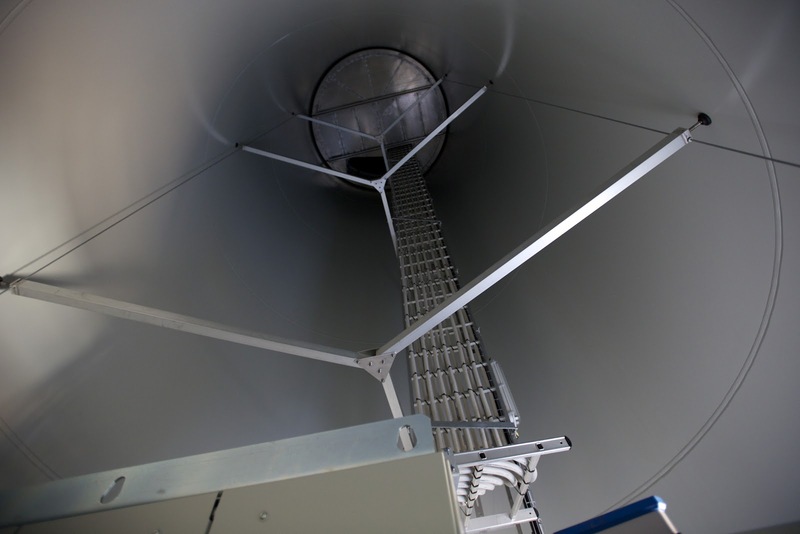 Workers “are also doing a lot of internal wiring in the turbines,” said Inlow adding the interconnecting underground collection system, which connects the turbines together into circuits, is being built. As this takes place, San Diego Gas and Electric crews are working on the switchyard and other structures that will tie the project up into the Sunrise Power Link, described as a 500-kilovolt “superhighway” connecting the Imperial Valley to San Diego County. So everyday workers along with cranes and other heavy machinery are assembling towers, rotors and turbines; an impressive feat to witness particularly when noticing the speed in which open desert becomes a turbine site. Construction manager Russell Graham said it takes about 60 hours to put up a turbine. As of Friday, more than 30 turbines could be seen standing from afar and many more will be seen in the upcoming months. “Our plan was six (turbines) a week and we’ll also have a few weeks when we may put up seven and possibly eight (turbines),” said Inlow, who expects 86 turbines to be up and delivering power by the end of this year. The remaining 26 turbines, she said, will surely be up and working by June 2013. 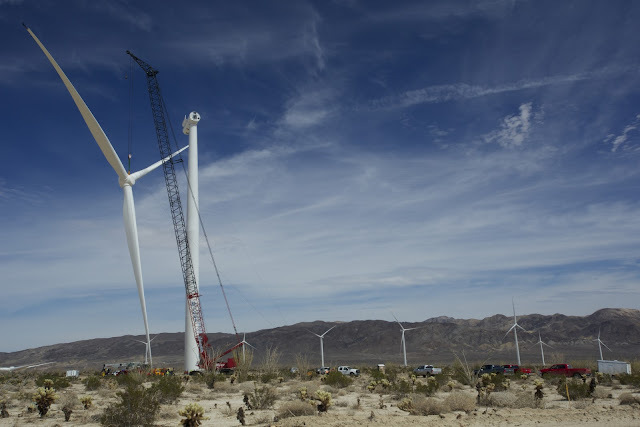 But Ocotillo Wind Express and the engineering that goes into building and connecting turbines across some 12,000 miles of BLM land is just a variable of a much bigger equation, one that hopes to find the answer to the country’s energy needs. Ocotillo Wind was a priority in the Obama administration’s effort to diversify the nation’s energy portfolio through a “fast-track” process. This priority is achieved on a variety of criteria, like necessary public participation, environmental analysis and its likelihood of success in the permitting process. This plan continues, and just this year, the BLM gave priority status to 17 projects: nine solar developments, six wind developments and two geothermal plants, according to Curtis, who noted these projects represent about 7,000 megawatts of power. But the fast-track process, just like Ocotillo Wind Express, has created unease among some community members. Native American tribes like the Quechan, have repeatedly called for the fast-track process and this project to stop, as it’s being built on an area archaeologically rich and spiritually important for them. Tribes also feel mitigation efforts are insufficient. This comes in spite of the environmental and financial benefits presented by those who support industrial renewable energy projects. According to an independent report, the project will bring about $442 million in revenue to the county over the 30-year life of the project. On the other hand, some Ocotillo residents fear for their health and safety, while at the same time dislike the aesthetic change of the desert. “We are just scared to death for our health,” said Ewing, who like many opposing the project, has fears, allegations and shows deep distrust of Pattern and the government branches that have approved the project. “There are plenty of scientists that have proven that low-frequency sound — the noise in these things, is proven to be unsafe and a bother (to) people,” he said. Ewing also alleges there isn’t enough wind in the area to support the project. “They (Pattern) say that they will be able to produce up to 320 megawatts of power. We think that they are going to be able to produce less than 20 percent of that,” said Ewing, who adds he is unsure if the project is properly engineered or inspected by the BLM or the county. 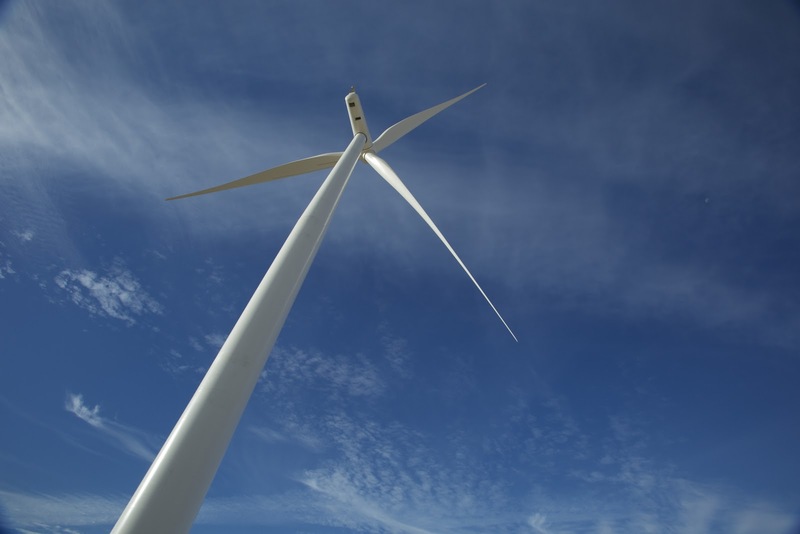 It should be noted Graham says the project will create about 265 megawatts of power as planned turbines were taken out of the project over environmental concerns. Meanwhile, county Planning Director Armando Villa notes he gets a report on the project every day. “We have hired engineers and inspectors that specialize in steel foundations to be out there,” he said. These reports have been posted every week since late May, up until the latest report, which is good through Sept. 9. The last report notes issues/concerns over dust suppression, trash management and generator emissions, among others. Some of these concerns appear on previous reports as well. However, reports also note the contractor addressed concerns in a timely manner. In addition, Pattern dismisses Ewing’s allegations. This last study surely opens more back and forth allegations, responses and findings on both ends of the spectrum. And yet, two things are certain in this project. Like all developments, Ocotillo Wind Express impacts the county, bringing benefits and costs. But whether one outweighs the other seems to be, depending on who answers, as contrasting as the way the errant knight Don Quixote and his faithful squire Sancho Panza saw the windmills.